Duracell is a name synonymous with long lasting batteries, and the pink bunny who keeps on drumming even until Judgment Day has been etched into our memories thanks to earlier advertising efforts a couple of decades ago. The company is still around, and they are still as reliable as ever when it comes to offering portable power solutions to the myriad of gadgets and gizmos that we now tend to carry. 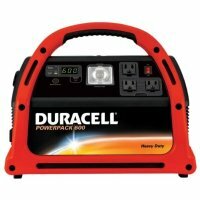 Their most recent release would be the Duracell Powerpack 450 with Voice, a solution that ought to be in the home of every American since recent surveys have shown that most Americans are not adequately equipped for power emergencies, be it at home or on the road. This is no ordinary copper top battery, as the Duracell Powerpack 450 with Voice prides itself in being a durable, stand-alone power supply with 450 watts of AC household power that can be used to juice up important electronics and appliances. The voice technology found within is a first when it comes to the portable power category, and is used to “talk” to consumers on how they are supposed to make the correct use of the Powerpack’s built-in vehicle jump-start system. In addition, it will also speak out instructions on how to inflate a tire with the Powerpack’s built-in air compressor, while letting them know just how much runtime a connected device has left. See what TiVo does? Skip all the commercials, lose the trademark smarts.